The jacket shouldn't be washed for any reason. If there is dirt or puke on the jacket you may handwash it carefully. You may also shower with the jacket on. If you wash the jacket in any other way you may lose your right arm. 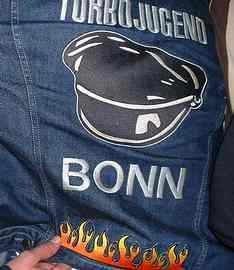 When you get your jacket it will be beptaised by the president, this involves a beer and your brand new jacket. Every member has to go through a trail time of about 3 months before they are accepted, this gives you the position of Prospect.